Diamonds and pearls sparkled in the sun at Windsor Castle this morning for Prince Harry and Meghan Markle’s royal wedding. The dazzling list of female attendees from royals to athletes and movie stars almost all chose to wear one of the two gems. There were just a few splashes of color in pretty pastel stones. See some of our favorite looks below. 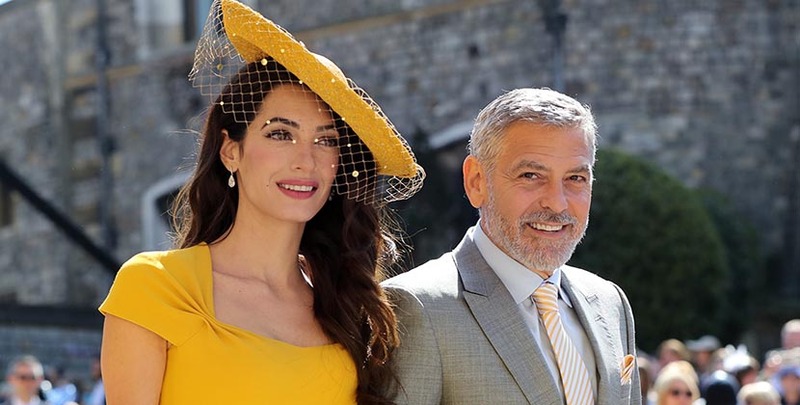 George Clooney with Amal Clooney who is wearing a Stella McCartney dress and 17-carat pear shape diamond drop earrings by Lorraine Schwartz. 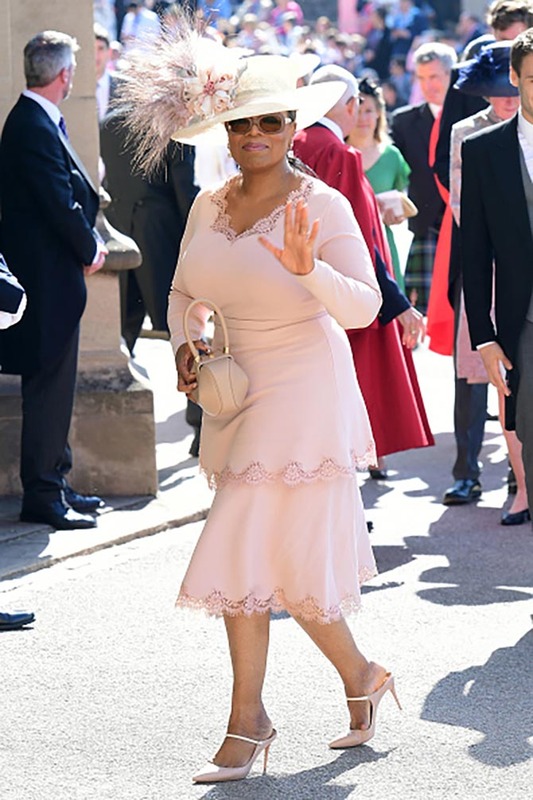 Oprah Winfrey wore stunning diamond pendant earrings she sports routinely with a dress by Stella McCartney and a hat by Philip Treacy. 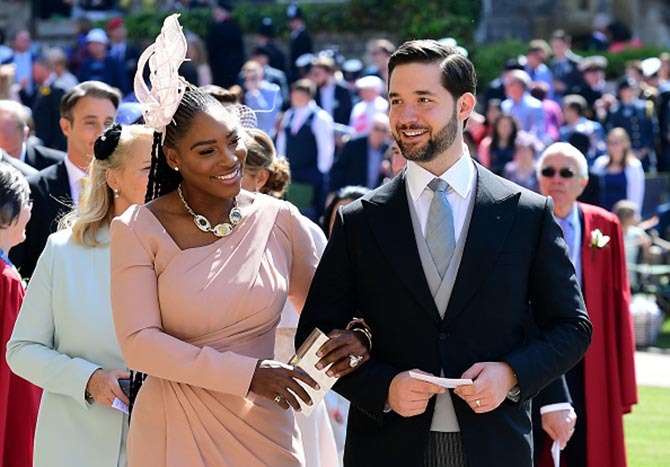 Newlyweds Alexis Ohanian with Serena Williams who is wearing a Bulgari Monete diamond and gold necklace with an Audemars Piguet watch and a Versace dress. Abigail Spencer in an Alessandra Rich dress and Beladora sapphire and diamond jewels with Priyanka Chopra who is wearing a Vivienne Westwood ensemble with diamond lightning bolt earrings and rings by Lorraine Schwartz. Lady Kitty Spencer paired diamond studs and a necklace with a green hat and dress. David Beckham with Victoria Beckham with is wearing one of her own dress designs and her diamond engagement ring. Gina Torres in a red dress, hat and vine ear climber. Pippa Middleton in a floral dress, hat and gold and diamond earrings. 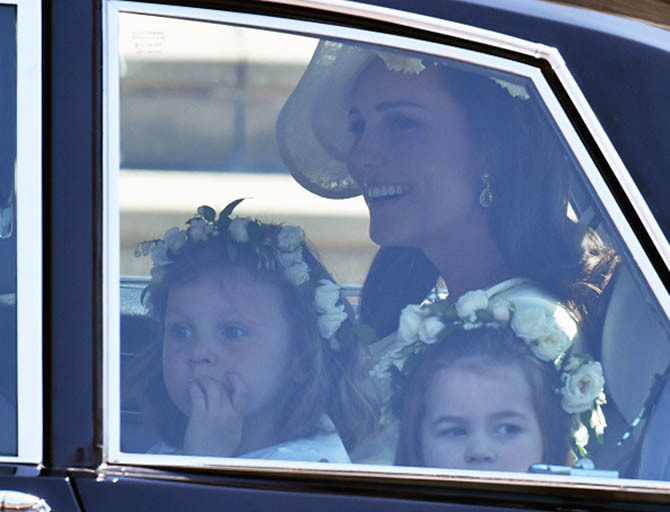 Catherine, Duchess of Cambridge (otherwise known as Kate Middleton) arrives with Prince Harry’s niece and bridesmaid Princess Charlotte, wearing primrose yellow wool silk tailored coat by Alexander McQueen, a hat by Philip Treacy and earrings from Kiki Mcdonough. 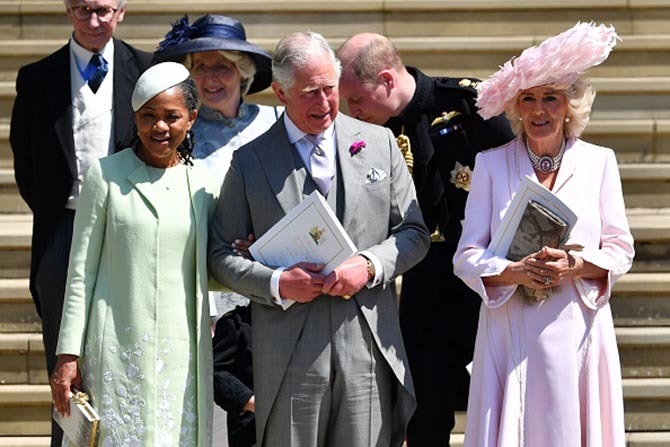 Prince Charles with Doria Ragland who is wearing an Oscar de la Renta dress, Stephen Jones hat and diamond and pearl earrings and Camilla, Duchess of Cornwall who is wearing an Anna Valentine coat dress, Philip Treacy hat and pink topaz and pearl necklace. 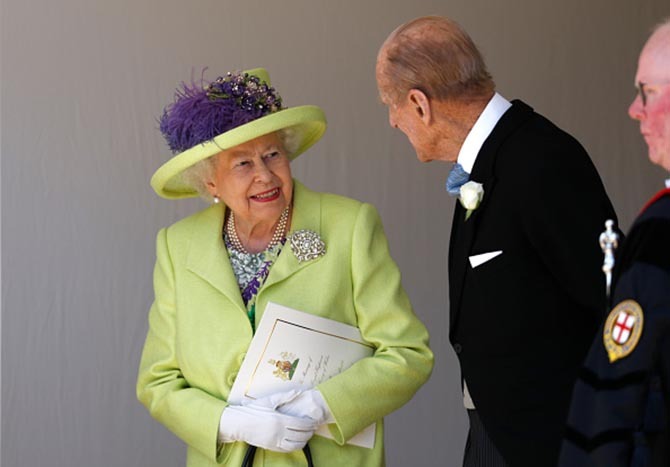 After the wedding Prince Philip, Duke of Edinburgh talking with Queen Elizabeth who is wearing a lime, lemon, purple and grey printed silk dress and coat by Stuart Parvin with a Angela Kelly hat, pearl earrings and necklace as well as The Richmond Diamond Brooch. The historic brooch was given to Princess Victoria Mary of Teck by the town of Richmond to mark her wedding to the Duke of York. The diamond and pearl jewel was made by Hunt & Roskell in 1893.